The airline was founded on 24 September 1946 by Australian Sydney H. de Kantzow and American Roy C. Farrell. The airline made the world's first non-stop transpolar flight flying over the North Pole in July 1998, which was also the maiden flight to arrive at the then new Hong Kong International Airport. The airline celebrated its 70th anniversary in 2016; and as of March 2018[update], its major shareholders are Swire Pacific, Qatar Airways and Air China. It is reciprocally one of the major shareholders of Air China. Cathay Pacific is the world's tenth largest airline measured in terms of sales, and fourteenth largest measured in terms of market capitalisation. In 2010, Cathay Pacific became the world's largest international cargo airline, along with main hub Hong Kong International Airport as the world's busiest airport in terms of cargo traffic. It is one of the founding members of the Oneworld alliance. Cathay Pacific's subsidiary Cathay Dragon is an affiliate member of Oneworld. Cathay Pacific Airways was founded on 24 September 1946 in Hong Kong, with Sydney "Syd" de Kantzow, Roy Farrell, as well as Neil Buchanan, Donald Brittan Evans and Robert "Bob" Stanley Russell were the initial shareholders. Buchanan and Russell already worked for de Kantzow and Farrell in the predecessor of Cathay Pacific, Roy Farrell Import-Export Company, which was initially headquartered in Shanghai. Both de Kantzow and Farrell were ex-air force pilots who had flown the Hump, a route over the Himalayan mountains. Farrell purchased the airline's first aircraft, a Douglas DC-3, nicknamed Betsy, in Bush Field, New York City in 1945.:29 The company began freight services on 28 January 1946 from Sydney to Shanghai, after Farrell and Russell flew the plane to Australia and obtained a license to carry freight (but not passengers) services earlier that month. :36–37 Its first commercial flight was a shipment of Australian goods. :37 The profitable business soon attracted attention from the Republic of China government officials. :44 After several instances where the company's planes were detained by authorities in Shanghai,:44 on 11 May 1946 the company relocated, flying its two planes to Hong Kong. Farrell and de Kantzow re-registered their business in Hong Kong on 24 September 1946 as "Cathay Pacific Airways Limited", while another sister company The Roy Farrell Export Import Company (Hong Kong) Limited was incorporated on 28 August 1946 and chartered some flights of Cathay. :58 According to International Directory of Company Histories, forming two companies are for tax purposes. They named the airline Cathay, the ancient name given to China, and Pacific because Farrell speculated that they would one day fly across the Pacific:56 (which happened in the 1970s). Moreover, to avoid the name "Air Cathay" as it was already occurred in a comic. :55 The Chinese name for the company ("國泰") was not settled on until the 1950s. It comes from a Chinese idiom meaning "grand and peaceful state" and was at the time often used by other businesses called "Cathay" in English. In the late 1940s, the Hong Kong government divided the local aviation market between Cathay Pacific and its only local competitor, the Jardine Matheson-owned Hong Kong Airways::117–118 Cathay Pacific was allocated routes to the south (including South-East Asia and Australia), while Hong Kong Airways was allocated routes to the north (including mainland China, Korea and Japan). The situation changed with the establishment of the People's Republic of China and the Korean War, which reduced the viability of the northern routes. In 1959, Cathay Pacific acquired Hong Kong Airways, and became the dominant airline in Hong Kong. Under Swire, another important sister company, HAECO, was established in 1950.:130 Nowadays, it is one of the major aeroplane repair service company of Hong Kong with division in other city of China. The airline prospered in the late 1950s and into the 1960s, helped by buying its archrival, Hong Kong Airways, on 1 July 1959.:118 Between 1962 and 1967, the airline recorded double digit growth on average every year and became one of the world's first airlines to operate international services to Fukuoka, Nagoya and Osaka in Japan. In 1964, it carried its one millionth passenger and acquired its first jet engine aircraft, the Convair 880. In the 1970s, Cathay Pacific installed a computerised reservation system and flight simulators. In 1971, Cathay Pacific Airways received the first wide-body aircraft 707-320B produced by Boeing. The new aircraft sported a new lively green colour known as Brunswick green. In 1974, Cathay Pacific almost purchased the McDonnell Douglas DC10 to open a new flight route. During the flight route application process with the British government, due to the pressure from the British government, Cathay Pacific Airways changed the application to apply for a route from Hong Kong to London using a Boeing 747. The application was ultimately rejected. [page needed] In 1979, the airline acquired its first Boeing 747 and applied for traffic rights to fly to London in 1980, with the first flight taking place on 16 July. By 1973, Cathay Pacific were carrying one million people every year. Expansion continued into the 1980s. Due to the worldwide economic boom, more business travelers, tourists, and cargo were flying than ever before. Cathay Pacific kept its nonstop service to Vancouver in 1983, with continuing service on to San Francisco in 1986 when an industry-wide boom encouraged route growth to many European and North American centres including London, Brisbane, Frankfurt, Amsterdam, Rome, Paris, Zurich and Manchester. 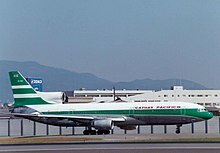 In 1982, Cathay Pacific Airways set up Cathay Pacific Cargo, which provided cargo service to ingratiate the trend of Hong Kong becoming one of the largest re-export trading ports of the world. The airline's long-haul dedicated cargo services started a twice a week with Hong Kong-Frankfurt-London service operated jointly with Lufthansa. On 15 May 1986, the airline went public and was listed in the Main Board of the Stock Exchange of Hong Kong. In January 1990, Cathay Pacific and its parent company, Swire Pacific, acquired a significant shareholding in Dragonair, and a 75% stake in cargo airline Air Hong Kong in 1994. During the early 1990s, the airline launched a program to upgrade its passenger service. The green and white striped livery was replaced with the current "brushwing" livery. In 1994 the airline invested in a new corporate identity, with a 23 million Hong Kong dollar program to update its image. The fleet was expected to have the new logo within four years. A Cathay Pacific Boeing 747-400 (VR-HOR) in the green lettuce livery with Union Flag taxing at Paris Charles de Gaulle International Airport (CDG / LFPG) in May 1993. This was prior to the 1997 handover. The airline began a US$9 billion fleet replacement program during the mid-1990s that gave it one of the youngest fleets in the world. In 1996, CITIC Pacific increased its holdings in Cathay Pacific from 10% to 25%, while the Swire Group holding was reduced to 44% as two other Chinese companies, CNAC(G) and CTS, also bought substantial holdings. According Cathay Pacific's entry in the volume 1 of International Directory of Company Histories, the disinvestment of 12.5% stake of Cathay Pacific by Swire Pacific, to a Chinese state-owned company, was regard "as evidence of China's sincerity in maintaining the prosperity of Hong Kong." On 1 July 1997, the administration of Hong Kong was transferred from the UK to the People's Republic of China as part of the Hong Kong handover. Most of the airline's aircraft were registered in Hong Kong with a registration beginning with "VR". Under the terms of an agreement within the Sino-British Joint Liaison Group (JLG), all registrations were changed by December 1997 to the prefix "B" used by the People's Republic of China and the Republic of China (Taiwan). Cathay Pacific aircraft formerly carried a painted UK Union Flag on the tail, but these were removed several years before the 1997 takeover. On 21 May 1998, Cathay Pacific took the first delivery of the Boeing 777-300 at a ceremony in Everett. On 21 September 1998, Cathay Pacific, together with American Airlines, British Airways, Canadian Airlines, and Qantas, co-founded the Oneworld airline alliance. Cathay Pacific temporarily took over the domestic and international operations of Philippine Airlines during its fourteen-day shutdown from 26 September to 7 October 1998. The airline was hurt by the Asian financial crisis of the late 1990s, but recorded a record HK$5 billion profit in 2000. On Monday, 6 July 1998, at 00:00 HKT, Kai Tak International Airport saw its last commercial departure, Cathay Pacific Flight 251 (a Boeing 747-400 with reg B-HOW ) to London Heathrow Airport, after over 73 years of operation. 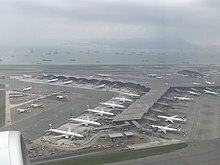 The next day, Cathay Pacific Flight 889 (a Boeing 747-400 from New York John F. Kennedy International Airport piloted by Captain Paul Horsting with reg B-HUJ), was the first arrival to the new Hong Kong International Airport at Chek Lap Kok, Hong Kong. Also on board were Captain Mike Lowes and First Officer Kelvin Ma. This flight was also the world's first nonstop transpolar flight from New York to Hong Kong. The flight, dubbed Polar One, takes about 16 hours between Hong Kong and New York Kennedy, saving about three to four hours compared to the one stop flight via Vancouver. It is one of the longest in the world at 8,055 mi (12,963 km). The 2000s saw Cathay Pacific experience labour relations issues, while completing the acquisition of Dragonair. On 28 November 2002, the airline took delivery of its first Airbus A340-600 aircraft at a ceremony at the Airbus factory in Toulouse. Cathay Pacific was the launch customer in Asia for the A340-600 and the aircraft was the first of three leased from International Lease Finance Corporation (ILFC). On 1 December 2005, Cathay Pacific ordered 16 Boeing 777-300ER aircraft, four on lease from ILFC, to be delivered between September 2007 and July 2010, plus options on 20 more of the type, two of which were converted to orders on 1 June 2006. The airline also ordered 3 more A330-300 on the same day, with the delivery of the aircraft scheduled for 2008. On 7 August 2007, Cathay Pacific ordered five more wide-body Boeing 777-300ER aircraft for a total price of about US$1.4 billion, increasing its commitment to a total of 23 of the aircraft type. In 2001, the Hong Kong Aircrew Officers Association (HKAOA) launched a "work to rule" campaign to further its campaign for pay improvements and changes to roster scheduling practices. The action involved pilots refusing to work flights that were not scheduled on their roster. Although this alone did not cause extensive disruption, rostered pilots began to call in sick for their flights. Combined with the work to rule campaign, the airline was unable to cover all of its scheduled flights, and cancellations resulted. Cathay Pacific steadfastly refused to negotiate with the HKAOA under threat of industrial action. On 9 July 2001, reportedly following a comprehensive review of the employment histories of all its pilots, the company fired 49 of its 1,500 pilots. This group became known colloquially as "the 49ers". Nearly half of the fired pilots were captains, representing five percent of the total pilot group. Of the 21 officers of the HKAOA, nine were fired, including four of the seven union negotiators. Then-HKAOA president Captain Nigel Demery took the view that "the firing was pure intimidation, a union-bust straight up, designed to be random enough to put the fear in all pilots that they might be next, no reason given". The dismissals were challenged in a number of legal proceedings, but none were reinstated. The airline later offered the 49 pilots it terminated in 2001 the chance to reapply for pilot positions with its cargo division, guaranteeing such applicants first interviews, subject to passing psychometric testing. Nineteen former employees applied and twelve were offered jobs. On 11 November 2009, 18 of the 49ers succeeded in the Hong Kong Court of First Instance concerning their joint claims for breach of contract, breach of the Employment Ordinance, and defamation. Judge Anselmo Reyes ruled that the airline had contravened the Employment Ordinance by dismissing the pilots without a valid reason, adding that they had been sacked primarily because of union activities. He also held that remarks by then chief operating officer Philip Chen Nanlok and current chief executive Tony Tyler after the sackings were defamatory. The judge handed the pilots a victory in their long-running legal battle, with individual awards of HK$3.3 million for defamation together with a month's pay and HK$150,000 for the sackings. On 24 December 2010, judges Frank Stock, Susan Kwan and Johnson Lam of the Court of Appeal overturned the judgment of the lower court to the extent that the claim for wrongful termination of contract was dismissed. The finding that Cathay Pacific wrongly sacked the 18 pilots for their union activities was upheld. The court upheld the defamation claim, but reduced the damages for the defamatory comments made by Cathay Pacific management. The judges also modified the judgment awarding payment of legal costs to the pilots and instead said that they should now pay some of Cathay's costs. The leader of the 49er Plaintiffs, Captain John Warham, launched a book titled The 49ers – The True Story on 25 March 2011. The pilots were awarded leave on 26 October 2011 to take their case to the Court of Final Appeal. The matter was heard before Hon. Mr. Justices Bokhary, Chan and Ribeiro who are all Permanent Judges of the Court of Final Appeal. The matters to be decided upon by the Court concerned wrongful termination of contract and the level of damages for defamation. The case was heard by the Court of Final Appeal on 27 August 2012. On 26 September 2012, 11 years after they were sacked, the 49ers were finally judged to have won the 3 prime issues of their legal case: breach of contract, breach of the Employment Ordinance, and defamation. The Court of Final Appeal agreed with the Court of Appeal's methodology for reducing the defamation damages. However, it reinstated one month's salary for each of the 49ers. Regarding breach of contract, the overall picture leading to dismissal and events immediately after were analysed by the courts, not just the dismissal letter. Regarding the Employment Ordinance, an important aspect was that the judgment defined the scope of "union activities" and its protection for workers in Hong Kong. The Court concluded: "Accordingly, most (possibly all) union-sponsored action is potentially protected by s 21B(1)(b), but if the action is not carried out “at [an] appropriate time”, it is excluded from the provision". There was no challenge by Cathay Pacific to the Court of Appeal's decision to uphold the original Judge's conclusion that the statements made by Cathay Executives were defamatory of the plaintiffs. John Warham, referring to the effect the fight has had on pilots' families, said: "In terms of human life, three people are dead because of what Cathay Pacific did to us. That's on their conscience, I hope they can live with that." On September 28, 2006, the airline underwent a shareholding realignment under which Dragonair became a wholly owned subsidiary but continued to operate under its own brand. Acquiring Dragonair meant gaining more access to the restricted, yet rapidly growing, Mainland China market and more opportunities for sharing of resources. CNAC, and its subsidiary, Air China, acquired a 17.5 percent stake in Cathay Pacific, and the airline doubled its shareholding in Air China to 17.5 percent. CITIC Pacific reduced its shareholding to 17.5 percent and Swire Group reduced its shareholding to 40 percent. Dragonair had originally planned significant international expansion. It was already operating services to Bangkok and Tokyo, and was to have a dedicated cargo fleet of nine Boeing 747-400BCF aircraft by 2009 operating to New York, Los Angeles, Chicago, San Francisco and Columbus. It had also acquired three Airbus A330-300 aircraft to commence services to Sydney and Seoul. Following the acquisition by Cathay Pacific, Dragonair's proposed expansion plans underwent a comprehensive route compatibility analysis with the Cathay network, in an effort to reduce duplication. Dragonair services to Bangkok and Tokyo were terminated, and new services launched to Sendai, Phuket, Manila and Kathmandu. With the merging of similar departments at the two previously separate airlines, some Dragonair staff have had their employment contracts transferred to Cathay Pacific, with the exception of Dragonair Pilots and Cabin Crew and others made redundant due to the efficiencies gained in the merger. This resulted in an approximately 37 percent decrease in the number of staff contractually employed by Dragonair. In January 2016, Cathay Pacific announced it was rebranding Dragonair as Cathay Dragon. To celebrate the airline's 60th anniversary in 2006, a year of road shows named the "Cathay Pacific 60th Anniversary Skyshow" was held where the public could see the developments of the airline, play games, meet some of the airline staff, and view vintage uniforms. Cathay Pacific also introduced anniversary merchandise and in-flight meals served by restaurants in Hong Kong in collaboration with the celebrations. In June 2008, Cathay Pacific entered into a plea bargain with the United States Department of Justice in respect of antitrust investigations over air cargo price fixing agreements. It was fined US$60 million. The airline has subsequently set up an internal Competition Compliance Office, reporting to chief operating officer John Slosar, to ensure that the Group complies with all relevant competition and antitrust laws in the jurisdiction in which it operates. The breaches for which Cathay Pacific Cargo were being investigated in the US were not illegal under Hong Kong competition law. In September 2008, three of Cathay Pacific's top ten global accounts, Lehmann Brothers, AIG and Merrill Lynch, hit financial trouble. In March 2009, the airline reported a record full-year loss of HK$8.56 billion for 2008, which was also the carrier's first since the 1997 Asian Financial Crisis. The record loss included fuel-hedging losses of HK$7.6 billion and a HK$468 million charge for a price-fixing fine in the US It had to scrap its final dividend. The hedging losses were a result of locking in fuel prices at higher than prevailing market price. As of the end of 2008, Cathay Pacific has hedged about half of its fuel needs until the end of 2011. The airline at the time estimated that it would face no further cash costs from the hedges if the average market price stood at US$75, enabling it recoup provisions it made in 2008. The flattening out of fuel prices resulted in Cathay Pacific recording a paper fuel hedging gain for its half-year reports for 2009. However, as a result of the global economic situation, the Group reported an operating loss. Given the current economic climate, and in line with the steps being taken by other major airlines around the world, the airline has undertaken a comprehensive review of all its routes and operations. This has resulted in frequencies being reduced to certain destinations, ad hoc cancellations on other routes, deferred capital expenditure, parked aircraft and introduced a Special Leave Scheme for staff to conserve money. According to CEO Tony Tyler, the yield from passengers was "hugely down" and the airline had lost "a lot of premium traffic". He noted that it could take 20 passengers in economy to make up for the lost revenue of one fewer first class passenger flying to New York from Hong Kong. In 2010, the airline set another record high profit, amounting to HK$14.05 billion despite record losses set in the same decade. At the same time, Cathay Pacific had taken delivery of several new aircraft types, including the Airbus A330-300 and Boeing 777-300 ER. Tony Tyler left his position as CEO at the airline on 31 March 2010 to pursue his new job at the IATA. Chief operating officer John Slosar had succeeded as the new CEO. In addition, New Zealand's Commerce Commission had dropped charges against Cathay Pacific concerning the air cargo price fixing agreements. In 2014, the airline underwent the largest network expansion in recent years which included the addition of links to Manchester, Zurich and Boston. On 8 October 2016, Cathay Pacific retired their last passenger Boeing 747, a 747-400, with a farewell scenic flight around Hong Kong after over 35 years of service of the type. Cathay operated the 747 since August 1979, when it was inaugurated on services to Australia. During the first half of 2016, Cathay Pacific's passenger yields fell 10 per cent, to the lowest in seven years as competing airlines from Mainland China increased direct service to the U.S. and Europe, hurting the company's revenue from its Hong Kong hub. In October, Cathay Pacific scrapped its profit forecast for the second half of the year, less than two months after its issuance. From September 15, 2016, Cathay Pacific decided to reintroduce fuel surcharge on many flights after its half-year net profits dropped over 80% and it suffered HK$4.5 billion loss from wrong bets on fuel prices. As of September 2016, Oil prices were halved from 2014 and stayed below US$50 a barrel. The airline had a data breach in 2018. Data of around 9.4 million passengers was compromised during the breach, with 860,000 passport numbers, 245,000 Hong Kong identity card numbers, 403 expired credit card numbers and 27 credit card numbers without CVV being accessed. However, no passwords were stolen. The breach was suspected in March 2018, but was confirmed only in May 2018. The airline restructured its organization to be more agile and faster in decision making as well as responding to customers' needs. It has also launched 13 new routes since 2017, introduced a wide range of changes to its service, including bringing back hot meals on its most busy route between Hong Kong and Taipei, designed an inflight menu that features famous Hong Kong dishes served in all cabins, and revamped its Business Class service proposition to provide more choice, more personalization, better presentation and improved quality in its food and beverages offerings. The airline has also invested significantly in other hard product and digital offerings such as an upgraded website, new or refurbished lounges across its network, including the first airline lounge yoga studio at The Pier - Business in Hong Kong. Wifi was introduced in 2017 and will be retrofitted across its fleet by 2020. In February 2019, the airline issued a profit alert to the Hong Kong Stock Exchange indicating a profit of HK$ 2.3 billion for the 2018 financial year, signalling early signs of success of its transformation. On 27 March 2019, Cathay Pacific officially announced to acquire full stake of HK Express, the only low-cost carrier in Hong Kong, citing to "expect synergis in generating a new business model and is a practical way to support long-term development and to enhance competitiveness". The transaction takes Cathay Pacific HK $4.93 billion total. The transaction is expected to be closed by December 2019 and by that time HK Express will become Cathay Pacific's wholly-owned subsidiary. Cathay Pacific's head office, Cathay City, is located at Hong Kong International Airport. Cathay City was scheduled to be built in increments between April and September 1998. The headquarters opened in 1998. Previously the airline's headquarters were at the Swire House, which was a complex in Central named after the airline's parent company. The company has taken a more down-to-earth approach in public relations under its transformation strategy since 2017. Its witty and proactive way of communicating new products and responding to issues has often been highly commended and lauded as 'God-like PR' in its home market. Cathay Pacific has diversified into related industries and sectors, including ground handling, aviation engineering, inflight catering. All Cathay Pacific aircraft carry the following livery, logos and trademarks: the "brushwing" livery on the body and on the vertical stabiliser, introduced in the early 1990s; the "Asia's world city" brandline, the Brand Hong Kong logotype and the dragon symbol; the Oneworld logo and the Swire Group logo. The brushwing logo consists of a calligraphic stroke against a green background; the stroke is intended to appear like the wing of a bird. The previous logo, consisting of green and white stripes, was in place from the early 1970s until 1994. Prior to 1997, all Cathay Pacific aircraft carried the British flag on the empennage. After the handover, aircraft carry the Brand Hong Kong logo and with HONG KONG or in Chinese 香港 under or beside the Brand Hong Kong logo instead of using the Hong Kong Special Administrative Region (HKSAR) flag. In fact, the HKSAR flag has never appeared on any aircraft. In November 2015, the airline revealed a refreshed version of its previous livery, featuring a simpler paint scheme while maintaining their trademark brushwing on an all-green tail. Boeing 777-300ER (B-KPM) was the first aircraft to wear the new livery. The second aircraft was a freighter aircraft, Boeing 747-400ERF (B-LIA). Cathay Pacific serves 80 destinations (including cargo), but not including codeshare in 46 countries and territories on five continents, with a well-developed Asian network. The airline serves a number of gateway cities in North America and Europe, with easy connections with its Oneworld and codeshare partners, American Airlines and British Airways via Los Angeles and London, respectively. In addition, the airline serves 10 French cities via a codeshare partnership with French national rail operator, SNCF, from Paris. The airline also has access to over 17 destinations in China through its subsidiary, Cathay Dragon. The airline also has a codeshare agreement with French high speed trains (SNCF) from TGV station at Paris-Charles de Gaulle Airport to ten French cities. as well as codeshare agreement with ferry operators - Cotai Jet, Turbo Jet and CKS to connect passengers from Hong Kong to Macao, Zhuhai, Shenzhen, Shekou and Guangzhou in the Greater Bay Area. Cathay Pacific operates an all-wide-body, dual-engine commercial fleet composed of Airbus A330, Airbus A350, and Boeing 777 aircraft and a Boeing 747 cargo fleet. The airline also has more Airbus A350, Boeing 777X and 777-300 aircraft on order. Cathay Pacific has two loyalty programs: The Marco Polo Club (The Club), the loyalty program, and Asia Miles, the travel reward program. Members of The Club are automatically enrolled as Asia Miles members. The Marco Polo Club is divided into four tiers, Green (entry level), Silver, Gold and Diamond, based on the member's past travel. A joining fee of US$100 is applicable for a Marco Polo Club membership. Members earn Club Points on eligible fare classes with Cathay Pacific, Cathay Dragon and Oneworld member airlines. These are used to calculate the member's eligibility for membership renewal, upgrade or downgrade during the membership year. Higher-tiered members are provided with increased travel benefits such as guaranteed Economy Class seat, additional baggage allowance, priority flight booking and airport lounge access. The Marco Polo Club membership is terminated after 12 months of inactivity or failure to meet minimum travel criteria as outlined in the membership guide and will be downgraded to Asia Miles member. The Green tier is the entry level to the Marco Polo Club. Benefits include dedicated 24-hour club service line for flight reservations, designated Marco Polo check-in counters, excess baggage allowance and lounge access redemption, and priority boarding. One Business Class lounge voucher will be issued for the member or their travelling companion at reaching 200 Club Points. Members are required to earn 20 Club Points or pay US$100 for membership renewal. Silver tier level is achieved or retained when the member earns 300 Club Points during the membership year. Additional benefits for Silver Card members include advanced seat reservations, priority waitlisting, Business Class check-in counters, 10 kg (22 lb) extra baggage allowance, priority baggage handling and Business Class lounge access when flying Cathay Pacific or Cathay Dragon operated flights. Additionally, members are eligible to use the Frequent Visitor e-Channels for seamless self-service immigration clearance at Hong Kong International Airport. At 450 Club Points, members will be issued two Business Class lounge vouchers for their travelling companions. Also, members are entitled to apply for at most three Membership Holidays in their lifetime, retaining their status for one year for each application. Marco Polo Club Silver tier status is equivalent to Oneworld Ruby tier status, which entitles members to Oneworld Ruby benefits when travelling on a Oneworld member airline. Gold tier level is achieved or retained when the member earns 600 Club Points during the membership year. Additional benefits for Gold Card members includes a guaranteed Economy Class seat on Cathay Pacific or Cathay Dragon flights booked 72 hours before departure, 15 kg (33 lb) or one piece of extra baggage allowance, Business Class lounge access with one accompanying guest when flying Cathay Pacific, Cathay Dragon and Oneworld operated flights and arrival lounge access when flying Cathay Pacific or Cathay Dragon operated and marketed flights. Two Business Class lounge vouchers will be issued for their travelling companions or members on their Asia Miles Redemption List at reaching 800 Club Points. At reaching 1000 Club Points, four Cabin Upgrade vouchers (for Cathay Pacific or Cathay Dragon operated short haul or medium haul routes) will be issued to members and their travelling companions. Marco Polo Club Gold tier status is equivalent to Oneworld Sapphire tier status, which entitles members to Oneworld Sapphire benefits when travelling on a Oneworld member airline. The second highest tier in the Marco Polo Club. Diamond tier level is achieved or retained when the member earns 1200 Club Points during the membership year. Additional benefits for Diamond Card members include top priority waitlisting, guaranteed Economy Class or Business Class seat on Cathay Pacific or Cathay Dragon flights booked 24 hours before departure, First Class check-in counters, 20 kg (44 lb) or one piece of extra baggage allowance, First Priority baggage handling, First Class lounge access with two guests when flying Cathay Pacific or Cathay Dragon operated flights, one guest when flying Oneworld operated flights and Business Class lounge access with two guests when flying on any airline. At 1400 Club Points, members will be issued with two First or Business lounge vouchers for their travelling companions or members on their Asia Miles Redemption List. At 1600 Club Points, four Cabin Upgrade vouchers (for any Cathay Pacific or Cathay Dragon operated routes) will be issued to members, travelling companions and members on their Asia Miles Redemption List. At 1800 Club Points, members are able to nominate one member for Marco Polo Gold tier membership. Marco Polo Club Diamond tier status is equivalent to Oneworld Emerald tier status, which entitles members to Oneworld Emerald benefits when travelling on a Oneworld member airline. The highest tier in the Marco Polo Club. Diamond Plus tier level offered annually to the top one percent of Diamond members worldwide "in recognition of their exceptional and consistent travel performance and their contribution to Cathay Pacific and Cathay Dragon." Diamond Plus and Diamond members are "considered in the same tier in every aspect". However, Diamond Plus get extra perks consisting of "Nomination of one companion to the Diamond tier", and "access to Cathay Pacific First Class lounges regardless which airline they are flying". Marco Polo Club Diamond Plus tier status is equivalent to Oneworld Emerald tier status, which entitles members to Oneworld Emerald benefits when travelling on a Oneworld member airline. Asia Miles was named "Best Frequent Flyer Program" at the 2011 Business Traveller Asia-Pacific Travel Awards ceremony. Members can earn Asia Miles with more than 500 partners in 9 categories: Airlines, Hotels, Finance & Insurance, Dining & Banquets, Retail, Travel & Leisure, Cars & Transport, Telecoms and Professional Services. Members can also earn miles when shopping online through iShop which offers a variety of products and brands – from books and electronics to clothing and accessories. Members can use the miles to redeem travel, electronic items, culinary delights, concert tickets and other lifestyle awards. Miles are valid for 3 years from the date of accrual. Asia Miles membership is free and open to individuals aged two or above. 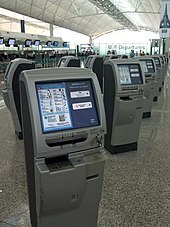 Beginning in 2007, Cathay Pacific launched more methods to check in for flights. Among them were self-check-in using a kiosk at Hong Kong International Airport and other select destinations and checking in via a mobile phone. Cathay Pacific also launched a mobile application on App Store and Google Play, formerly named CX Mobile. Passengers can use the application to check flight arrivals and departures, check in for their flights, and read about the destinations they are flying to using City Guides. The app has become a hit with passengers, making Cathay Pacific one of the industry leaders in offering mobile services to users of smart phones. Cathay Pacific is also now following a trend among many airlines to improve its brand image to customers and shareholders with social media, and is ranked fourth worldwide. The airline now uses a range of social media tools including Facebook, Flickr, Twitter, Instagram, YouTube and blogging to share ideas with customers. In addition, it has launched a virtual tour to enable passengers to experience Cathay Pacific's new cabins and services without having to step aboard the aircraft. On 4 January 2011, the cargo division of the airline, Cathay Pacific Cargo, became the first airline operating out of Hong Kong to fully switch to e-air waybill. This eliminates the need for all paper documents when issuing air waybills. The International Air Transport Association (IATA) selected nine countries and territories and airlines in which to run the e-AWB pilot program, including Hong Kong and Cathay Pacific. First Class is available solely on board select Boeing 777-300ER aircraft, and features 6 seats in a 1-1-1 configuration. The first-class seats can be converted into fully lie-flat beds measuring 36 in × 81 in (91 cm × 206 cm). The seats include a massage function, a personal closet, an ottoman for stowage or guest seating, and adjustable 18.5 in (47 cm), HD personal televisions (PTV). Cathay Pacific introduced a new Business Class seat in 2011, featuring reverse herringbone seating in a 1-2-1 configuration. Each seat converts into a fully flat bed of length 82 inches (208 cm), with a width of up to 21 inches (53 cm). Each seat features a small enclosed side cabinet, and an adjustable 18.5 in (47 cm( personal television. In 2016, upon delivery of brand new Airbus A350s, Cathay Pacific introduced a refreshed reverse herringbone seat designed by Porsche Design, with HD personal televisions and additional enclosed storage space on the side. 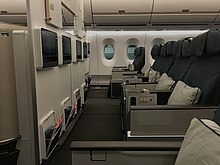 The new Regional Business Class is provided on Cathay Pacific's regionally configured Boeing 777s (excluding the 777-300ER) and selected Airbus A330-300s. Regional Business Class seats have 21 in (53 cm) width and recline to 47 in (120 cm) of pitch and feature electrical recline and leg rest. A 12 in (30 cm) PTV is located in the seat back offers AVOD. Cathay Pacific introduced a Premium Economy Class in March 2012. The seat pitch is 38 inches – six inches more than Economy Class – and the seat itself is wider and have a bigger recline. It has a large meal table, cocktail table, footrest, a 10.6-inch personal television, an in-seat power outlet, a multi-port connector for personal devices, and extra personal stowage space. The Premium Economy Class seat offers a higher level of comfort with more living space in a separate cabin before the Economy Class zone. In 2016, on delivery of the Airbus A350-900 fleet, Cathay Pacific introduced a new Premium Economy seat, which features a 12.1 in (31 cm) HD PTV, and improved pitch of 40 inches (102 cm). The new seats are configured in a 2-4-2 configuration, with a width of 18.5 in (47 cm). Cathay Pacific introduced a new economy class in March 2012. They have a six-inch recline (two inches over the current long-haul economy seat). These seats are 17.5 in (44 cm) in width and have 32 in (81 cm) of pitch. Studio CX, Cathay Pacific's in-flight entertainment system, equipped with personal televisions (PTVs) in every seat, offers movies, Asian and Western TV programs, music and games. In addition, the airline provides a range of different newspapers and magazines from around the world, including the airline's in-flight magazine Discovery. Passengers with visual impairment can request for Hong Kong's South China Morning Post in Braille to be available on board. Studio CX provides Audio/Video on Demand (AVOD) for every passenger and offers up to 100 movies, 350 TV programs, about 1000 CD albums in 25 different genres, 25 radio channels and more than 70 interactive games. Food and beverages are complimentary on all flights, with two hot meals generally served on each flight for long haul flights, along with free alcoholic beverages. Foods served on flights from Hong Kong are provided by Cathay Pacific Catering Services (CPCS) facilities in Hong Kong. CLS Catering Services Limited, a joint venture with LSG Sky Chefs, provides the inflight catering from Toronto and Vancouver airports; while Vietnam Air Caterers, a joint venture between CPCS and Vietnam Airlines, provides the inflight catering for flights from Ho Chi Minh City.For Manila-Hong Kong, they usually serve snacks in a snack bag, called a complimentary snack and drink. It contains a pastry or wrap in a box or a paper bag, an Anzac Cookie, an Antiseptic Towelette and a Nestea Lemon Tea for Taipei flights and a Sunkist Mango Juice or a Bottled Water for Manila flights. For flights to and fro Taipei, a simplified lunch with hot rice is served, and the four varieties are served in rotation on flights. Cathay Pacific had nine incidents and accidents over its history, although none have resulted in a hull loss or loss of life since 1972. On 16 July 1948, Miss Macao, a Cathay Pacific-subsidiary-operated Consolidated PBY-5A Catalina (VR-HDT) from Macau to Hong Kong was hijacked by four men, who killed the pilot after take-off. The aircraft crashed in the Pearl River Delta near Zhuhai. Twenty-six people died, leaving only one survivor, a hijacker. This was the first hijacking of a commercial airliner in the world. On 24 February 1949, a Cathay Pacific Douglas DC-3 (VR-HDG) from Manila to Hong Kong, crashed near Braemar Reservoir after a go-around in poor weather. All 23 people on board died. On 13 September 1949, a Cathay Pacific Douglas DC-3 (VR-HDW) departing from Anisakan, Burma, crashed on take-off when the right hand main gear leg collapsed. There were no reported fatalities. On 23 July 1954, a Cathay Pacific Douglas DC-4 (VR-HEU) from Bangkok to Hong Kong was shot down by aircraft of the People's Liberation Army Air Force in the South China Sea near Hainan Island. Ten people died, leaving nine survivors. After the incident, Cathay Pacific received an apology and compensation from the People's Liberation Army Air Force. It was apparently mistaken for a Nationalist Chinese military aircraft. On 5 November 1967, Cathay Pacific Flight 33, operated by a Convair 880 (VR-HFX) from Hong Kong to Saigon, overran the runway at Kai Tak Airport. One person was killed and the aircraft was written off. On 15 June 1972, Cathay Pacific Flight 700Z, operated by a Convair 880 (VR-HFZ) from Bangkok to Hong Kong, disintegrated and crashed while the aircraft was flying at 29,000 feet (8,800 m) over Pleiku, Vietnam after a bomb exploded in a suitcase placed under a seat in the cabin, killing all 81 people on board. On April 13, 2010, Cathay Pacific Flight 780, an Airbus A330-342 (B-HLL) from Surabaya Juanda International Airport to Hong Kong landed safely after both engines failed due to contaminated fuel. 57 passengers were injured in the ensuing slide evacuation. Its two pilots received the Polaris Award from the International Federation of Air Line Pilots' Associations, for their heroism and airmanship. ^ a b "Hong Kong". Cathay Pacific. Retrieved 23 December 2016. "Address Head Office: Cathay Pacific City, 8 Scenic Road, Hong Kong International Airport, Lantau, Hong Kong"
^ Cathay Pacific (2017). Cathay Pacific Airways Limited – CATHAY PACIFIC FACT SHEET 2017 (PDF) (Report). ^ Cathay Pacific (2016). Cathay Pacific Airways Limited – Interim Report 2016 (PDF) (Report). p. 1. Retrieved 23 December 2016. ^ a b "Airline Fleet - Cathay Pacific". www.cathaypacific.com. ^ "The World's Biggest Public Companies". Forbes. Retrieved 19 July 2016. ^ Denslow, Neil (26 January 2011). "Cathay Pacific, Hong Kong Airport Become Biggest for Freight". Businessweek. Archived from the original on 17 April 2011. Retrieved 22 February 2013. ^ a b c d e "History – Those Were the Days". Cathay Pacific. Retrieved 23 December 2016. ^ a b c d e f g h i j k Document Ref. No. 000B6829788 of Cathay Pacific Holdings (ex-Cathay Pacific Airways). Cyber Search Centre (statutory filing). Hong Kong: Companies Registry. 1946–1953 [digitized circa 2000s]. ^ a b Footer, Mark (20 July 2008) [updated 7 October 2016]. "Flight of no return: How a Cathay Pacific plane became the first hijacked commercial airliner". "Post Magazine" section. South China Morning Post. Hong Kong. Retrieved 16 April 2018. ^ a b c d e f g h i j k l m n o p q r s t u v w Young, Gavin (1988). Beyond Lion Rock: The Story of Cathay Pacific Airways. Hutchinson. ^ "Cargo by air to far east". The Sydney Morning Herald. 25 February 1946 [digitized in 2010s]. p. 5. Retrieved 22 April 2018 – via National Library of Australia. ^ 吳 [Ng], 邦謀 [James] (2016) [First edition published in 2015]. Hong Kong Aviation: 125-year history 香港航空125年 (in Chinese) (revised ed.). Chung Hwa Book Company (Hong Kong). p. 202. ISBN 9789888420544. Retrieved 13 December 2017. ^ a b c d e f g h i Vlessing, Etan; Ingram, Frederick C. (2017). Pederson, Jay P., ed. "Cathay Pacific Airways Limited". International Directory of Company Histories. Farmington Hills, Michigan: Gale. 185: 136–142. ISBN 978-1-55862-959-2. ^ Goufrani, Muguette. "Fly away with Cathay Pacific". Air Highways. Archived from the original on 29 January 2006. Retrieved 8 March 2006. ^ "Definition of "国泰民安"". chinese.yabla.com. Retrieved 13 January 2018. ^ a b Derdak, Thomas, ed. (1988). "Swire Pacific Ltd". International Directory of Company Histories. Chicago, London: St. James Press. 1: 521–522. ISBN 0-912289-10-4. ^ "Fact Sheet". Cathay Pacific. Retrieved 14 April 2018. ^ a b "2017 Annual Report" (PDF). Cathay Pacific Airways. 3 April 2018. Retrieved 14 April 2018 – via Hong Kong Exchanges and Clearing Limited website. ^ a b "History – New Horizons". Cathay Pacific. Retrieved 23 December 2016. ^ "Cathay Pacific Airways Newsletter - September 1971". CAPT.CHARLES 'CHIC' EATHER (RET.). Retrieved 2019-03-04. ^ Far Eastern Economic Review, 142(45), 60. ^ "History - Cathay Pacific". www.cathaypacific.com. Retrieved 2019-03-04. ^ "About Cathay Pacific Cargo - Cathay Pacific Cargo". www.cathaypacificcargo.com. Retrieved 2019-03-04. ^ "List of listed companies on Main Board". 2017 HKEX Factbook (PDF). Hong Kong Exchanges and Clearing. 2018. p. 896. Retrieved 9 November 2018. ^ "History – Year 1990". Dragonair. Retrieved 23 December 2016. ^ "History – Air Hong Kong". Air Hong Kong. Retrieved 9 July 2009. ^ a b c "History – A Change of Image". Cathay Pacific. Retrieved 23 December 2016. ^ a b "Cathay Pacific takes to the sky with new logo." New Sunday Times. 15 September 1994. Page 18. Retrieved from Google News (10 of 51) on 9 December 2011. ^ "Hong Kong – A New Era – Civil Aviation". Hong Kong SAR Government. Retrieved 2 July 2009. ^ "Cathay Pacific – Picture of the Boeing 747-267B aircraft at Vancouver". Airliners.net. Retrieved 24 May 2009. ^ "Cathay Pacific – Picture of the Boeing 747-267B aircraft at Hong Kong". Airliners.net. Retrieved 24 May 2009. ^ "Boeing and Cathay Pacific Airways Celebrate First 777-300 Delivery" (Press release). Boeing. 21 May 1998. Archived from the original on 7 August 2007. Retrieved 5 September 2009. ^ "Fact Sheet – oneworld". Cathay Pacific. Retrieved 23 December 2016. ^ Brady, Diane (22 September 1998). "Cathay's Alliance Poses Threat To Rivals Among Asian Airlines". Wall Street Journal. Retrieved 23 December 2016. ^ "Cathay Pacific to Run Philippine Airlines'". New York Times. 26 September 1998. Retrieved 24 April 2013. ^ "Cathay Pacific posts record annual profit for 2000" (Press release). Cathay Pacific. 7 March 2001. Retrieved 2 July 2009. ^ "Commemorative certificate for first-day passengers" (Press release). Airport Authority Hong Kong. 5 July 1998. Retrieved 5 July 2009. ^ "Cathay Pacific's non-stop New York flight 'strengthens Hong Kong's hub'" (Press release). Cathay Pacific. 11 June 2004. Retrieved 23 December 2016. ^ "Hon Antony Leung tours 1st Cathay Pacific Airbus A340-600" (Press release). Cathay Pacific. 28 November 2002. Retrieved 23 December 2016. ^ "Boeing Statement on Cathay Pacific Airways 777-300ER Selection" (Press release). Boeing. 1 December 2005. Archived from the original on 14 October 2008. Retrieved 4 July 2009. ^ "Boeing, Cathay Pacific Airways Finalize Agreement for Additional 777-300ERs" (Press release). Boeing. 1 June 2006. Archived from the original on 23 October 2007. Retrieved 4 July 2009. ^ "Cathay Pacific Places Biggest Ever Order For New Aircraft" (Press release). Cathay Pacific. 1 December 2005. Retrieved 23 December 2016. ^ "Cathay Pacific Airways Orders Five Additional Boeing 777-300ERs" (Press release). Boeing. 7 August 2007. Archived from the original on 14 October 2008. Retrieved 4 July 2009. ^ "Pilots' work-to-rule causing delays at Cathay Pacific". Kyodo News International, Inc. 4 July 2001. Retrieved 23 December 2016. ^ a b Hopkins, George E. (May–June 2002). "Cathay Pacific Pilots on the Brink" (PDF). Air Line Pilot. p. 20. Retrieved 4 July 2009. ^ "The 49ers – The True Story: Amazon.co.uk: John Warham: Books". Amazon.co.uk. Retrieved 2012-06-26. ^ Hong Kong Legal Reference System (26 September 2012). "FACV No. 13 of 2011". p. 35. ^ van Dale, Jennifer; Narayan, Rashi (October 2012). Darby, Tim, ed. "Court of Final Appeal Issues Important Judgment about Annual Leave". American Bar Association, International Labor & Employment Law Committee Newsletter. Baker & McKenzie, Hong Kong. ^ Benitez, Mary Ann (27 September 2012). "Twin legal blows for Cathay spell joy for workers" (PDF). The Standard. ^ "Fact Sheet – Major Subsidiaries and Associates". Cathay Pacific. Retrieved 23 December 2016. ^ "History – Into the New Millennium". Cathay Pacific. Retrieved 23 December 2016. ^ "Cathay, Air China Deal Enables Dragonair Purchase". Business Travel News. 17 July 2006. Retrieved 23 December 2016. ^ "Dragonair to more than double size of cargo fleet by end-2008" (Press release). Dragonair. 6 May 2004. Archived from the original on 9 September 2011. Retrieved 23 December 2016. ^ "Dragonair gets green light for Sydney/Hong Kong services". Travel Weekly. Reed Business Information. 19 April 2004. Archived from the original on 28 December 2008. Retrieved 4 July 2009. ^ "Cathay Pacific group enters new era with rebranding of Dragonair as Cathay Dragon" (Press release). Cathay Pacific Group. 28 January 2016. Retrieved 23 December 2016. ^ "Cathay Pacific takes 60th Anniversary Skyshow on the road" (Press release). Cathay Pacific. 20 May 2006. Retrieved 23 December 2016. ^ "Major International Airlines Agree to Plead Guilty and Pay Criminal Fines Totaling More Than $500 Million for Fixing Prices on Air Cargo Rates" (Press release). United States Department of Justice. 26 June 2008. Retrieved 4 July 2009. ^ "Announcement Plea Agreement with United States Department of Justice" (PDF) (Press release). Cathay Pacific. 26 June 2008. Retrieved 4 September 2009. ^ "Chairman speaks on Overcoming Adversity at Aerospace Forum Asia luncheon (Jun 10, 2009)". Cathay Pacifc. Retrieved 22 December 2016. ^ Leung, Wendy (11 March 2009). "Cathay Pacific to delay planes, review routes on loss". Bloomberg L.P. Archived from the original on 25 October 2012. Retrieved 23 December 2016. ^ Chan, Sue Ling (15 April 2009). "Cathay, Singapore Face Tough Decisions". Bloomberg L. P. Archived from the original on 25 October 2012. Retrieved 23 December 2016. ^ Akkermans, Joost; Leung, Wendy (17 March 2009). "Cathay Pacific's Tyler doesn't expect recovery soon". Bloomberg L. P. Archived from the original on 25 October 2012. Retrieved 23 December 2016. ^ Chiu, Joanne (9 March 2011). "Cathay Pacific Net Nearly Triples". The Wall Street Journal. Retrieved 23 December 2016. ^ "Cathay Pacific announces senior management changes" (Press release). Cathay Pacific. 3 December 2010. Retrieved 23 December 2016. ^ Rutherford, Hamish (28 April 2011). "Commission drops some airline charges". Stuff. New Zealand. Retrieved 23 September 2011. ^ Liu, Jim (7 October 2016). "Flashback – Cathay Pacific Summer 1979 Boeing 747 operations". Routes Online. Retrieved 23 December 2016. ^ "Cathay Pacific says big slump in number of premium travelers from Hong Kong". The National. Bloomberg. Aug 18, 2016. Retrieved 1 January 2017. ^ Ng, Eric (October 12, 2016). "Cathay Pacific lowers second-half profit forecast as overcapacity, competition take a toll". The South China Morning Post. Retrieved 1 January 2017. ^ a b Sun, Nikki (Sep 5, 2016). "HK$109 surcharge for Cathay and Dragonair passengers flying into Hong Kong after wrong-way bet on oil prices". The South China Morning Post. Retrieved 1 March 2017. ^ "Cathay Pacific flags data breach affecting 9.4 million passengers". Reuters. Retrieved 24 October 2018. ^ "Cathay Pacific data hack hits 9.4 million passengers". BBC News. Retrieved 25 October 2018. ^ "Nothing succeeds like success: Rupert Hogg, Cathay Pacific | Airlines". www.airlines.iata.org. Retrieved 2019-03-09. 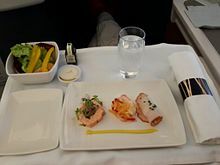 ^ "Full hot meals back on TPE flights - FlyerTalk Forums". www.flyertalk.com. Retrieved 2019-03-09. ^ "Cathay Pacific Rolls Out 'Hong Kong Flavours'". TravelPress. 2019-02-07. Retrieved 2019-03-09. ^ "Here's what Cathay Pacific's new business class dining concept will offer". Business Traveller. Retrieved 2019-03-09. ^ "Cathay Pacific launches The Sanctuary by Pure Yoga in Hong Kong". South China Morning Post. 2019-01-28. Retrieved 2019-03-09. ^ "Cathay Pacific's entire wide-body fleet is getting wifi". Business Traveller. Retrieved 2019-03-09. ^ "Cathay Pacific issues profit alert | News | Airfinance Journal". www.airfinancejournal.com. Retrieved 2019-03-09. ^ "Cathay Pacific Airways Limited - Disclosable Transaction: Acquisition of Hong Kong Express Airways Limited" (PDF). Cathay Pacific Press Release. 27 March 2019. Retrieved 27 March 2019. ^ "Cathay Pacific to buy airline HK Express". 2019-03-27. Retrieved 2019-04-02. ^ Walker, Karen. "Hangover cure." Airline Business at Flight International. 1 December 1997. Retrieved 7 November 2011. ^ "Cathay Pacific wins award for providing a smoke-free workplace at its Hong Kong Headquarters" (Press release). Cathay Pacific. 6 January 2005. Retrieved 23 December 2016. ^ "World Airline Directory" (PDF). Flight International. 30 March 1985. p. 68. Retrieved 17 June 2009. 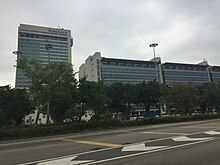 "Head Office: Swire House, 9 Connaught Road, C, Hong Kong"
^ "國泰航空神級公關 - Google Search". www.google.com. Retrieved 2019-03-09. ^ "Aviation Hong Kong". Swire Pacific. Archived from the original on 25 June 2008. Retrieved 3 April 2010. ^ a b c d e f g h i j k l m n o p q r s t u v w x y z aa ab "Cathay Pacific Airways Limited Annual Report 2016" (PDF). ^ "Brand Overview – Background to Brand Hong Kong". Brand Hong Kong. Government of Hong Kong. August 2007. Archived from the original on 27 May 2009. Retrieved 4 July 2009. ^ "Primary Signature" (PDF). Brand Hong Kong. Government of Hong Kong. February 2003. Archived from the original (PDF) on 29 January 2007. Retrieved 4 July 2009. ^ Boicos, Dane (3 November 2015). "Cathay Pacific's New Livery". Journey Pro. Retrieved 23 December 2016. ^ a b "Fact Sheet – Routes and Destinations". Cathay Pacific. Retrieved 23 December 2016. ^ "Profile on Cathay Pacific". CAPA. Centre for Aviation. Archived from the original on 2016-10-29. Retrieved 2016-10-29. ^ "Cathay Pacific and Air Astana Announce Codeshare Agreement". aviationtribune.com. Aviation Tribune OÜ. 5 March 2018. Retrieved 5 March 2018. ^ Air Canada and Cathay Pacific to Introduce Codeshare Services and Reciprocal Mileage Accrual and Redemption Benefits in Strategic Cooperation. aircanada.com. Retrieved on 22 Dec 2016. ^ . lufthansagroup.com. Retrieved on 27 Mar 2016. ^ 2018, UBM (UK) Ltd. "Malaysia Airlines begins Cathay Pacific Trans-Pacific codeshare in S18". ^ Cathay Pacific announces new codeshare agreement with MIAT Mongolian Airlines. Cathaypacific.com. Retrieved on 28 June 2017. ^ Customers to benefit from Cathay Pacific / Qatar Airways strategic agreement between Hong Kong and Doha. Cathaypacific.com. Retrieved on 16 May 2014. ^ "New HKSAR/France air services arrangement provides new code-share opportunities" (Press release). Government of the Hong Kong Special Administrative Region. 17 June 2004. Retrieved 2 July 2009. ^ "About Marco Polo Club". Cathay Pacific. Retrieved 23 December 2016. ^ "The Marco Polo Club – Privacy and terms". Cathay Pacific. Retrieved 23 December 2016. ^ a b c d "Club benefits". Cathay Pacific. Retrieved 23 December 2016. ^ "Cathay Pacific and Dragonair's frequent flyers enjoy faster immigration clearance through Frequent Visitor e-Channels" (Press release). Cathay Pacific. 14 September 2009. Retrieved 23 December 2016. ^ "Diamond Plus Tier". 12 August 2010. Retrieved 23 October 2011. ^ "2011 Business Traveller Asia-Pacific Awards". Business Traveller Asia. Archived from the original on 2 March 2012. Retrieved 23 December 2016. ^ "Asia Miles". Cathay Pacific. Retrieved 23 December 2016. ^ "Asia Miles – Terms and Conditions". Asia Miles Limited. Retrieved 19 June 2012. ^ Ko, Carol (22 January 2009). "Check-in on Cathay Pacific with mobile phones". MIS Asia. Archived from the original on 30 January 2009. Retrieved 2 September 2009. ^ "Cathay Pacific emerges as industry leader with new mobile application" (Press release). Cathay Pacific. 1 September 2009. Retrieved 23 December 2016. ^ "Cathay Pacific Blog". Cathay Pacific. Archived from the original on 31 August 2009. Retrieved 22 August 2009. ^ "Experience Cathay Pacific without stepping on the plane". Shashank Nigam. Retrieved 22 August 2009. ^ "Cathay Pacific rolls out electronic air waybills in Hong Kong, marking important step in transition to e-freight" (Press release). Cathay Pacific. 4 January 2011. Retrieved 23 December 2016. ^ "First Class". Cathay Pacific. Retrieved 23 December 2016. ^ "Your Guide to the First Class Suite" (PDF). Cathay Pacific. Retrieved 4 July 2009. ^ "Cathay Pacific Boeing 777s get a first class facelift". Australian Business Traveller. Retrieved 2018-12-26. ^ "Cathay Pacific unveils new business class seats: everything you need to know". Australian Business Traveller. Retrieved 2018-12-26. ^ "Revealed: Cathay Pacific's new Airbus A350 business class seat". Australian Business Traveller. Retrieved 2018-12-26. ^ "New Regional Business Class". Cathay Pacific. Retrieved 23 December 2016. ^ "Cathay Pacific unveils new Regional Business Class" (Press release). Cathay Pacific. 24 September 2012. Retrieved 23 December 2016. ^ "Business Class Comparison Chart". seatguru.com. TripAdvisor LLC. Archived from the original on 15 June 2008. Retrieved 4 July 2009. ^ "Cathay Pacific to launch Premium Economy on 777-300ER from March 2012". Airline Route. Retrieved 20 August 2011. ^ "Up close with Cathay Pacific's new Airbus A350 premium economy seat". Australian Business Traveller. Retrieved 2018-12-26. ^ "New Economy Class". Cathay Pacific. Retrieved 23 December 2016. ^ "Cathay Pacific A330 International Economy Seat Chart". Airreview. Retrieved 13 January 2012. ^ "Cathay, Air France Add Airbags as Crash Rules Tighten". Bloomberg. 9 June 2010. Archived from the original on 22 February 2015. Retrieved 23 December 2016. ^ "Cathay Pacific – Reviews – Fleet, Aircraft, Seats & Cabin comfort – Opinions with pictures". Airreview.com. Retrieved 29 June 2013. ^ "Cathay Pacific Airways Limited – 2007 Interim Report" (PDF). Cathay Pacific. 2007. p. 5. Retrieved 11 July 2009. ^ "Inflight reading". Cathay Pacific. Retrieved 23 December 2016. ^ "Cathay Pacific IFE". Airreview. Retrieved 13 January 2012. ^ "Aircraft and Fleet". Retrieved 14 July 2014. The "New Regional Product" includes StudioCX. ^ "Cathay Pacific Inflight service". Airreview. Retrieved 13 January 2012. ^ "Cathay Pacific Catering Services – Customers". Cathay Pacific Catering Services. Retrieved 3 July 2009. ^ "LSG Sky Chefs – Toronto (YYZ)". LSG Sky Chefs. LSG Lufthansa Service Holding AG. Retrieved 3 July 2009. ^ "LSG Sky Chefs – Vancouver (YVR)". LSG Sky Chefs. LSG Lufthansa Service Holding AG. Retrieved 3 July 2009. ^ "Our Airline Customers – Customer List". VN/CX Catering Services Ltd. Archived from the original on 22 February 2008. Retrieved 3 July 2009. ^ "Hijacking description – Cosnsolidated PBY-5A Catalina VR-HDT". Aviation Safety Network. Retrieved 2 July 2009. ^ "Accident description – Douglas C-47A-90-DL VR-HDG". Aviation Safety Network. Retrieved 2 July 2009. ^ "Accident description – Douglas C-47A-30-DK VR-HDW". Aviation Safety Network. Retrieved 11 October 2011. ^ Kebabjian, Richard. "Accident details – Douglas DC-4 VR-HEU". planecrashinfo.com. Retrieved 2 July 2009. 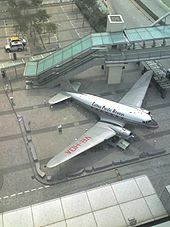 ^ "ASN Aircraft accident Convair CV-880-22M-3 VR-HFX Hong Kong-Kai Tak International Airport (HKG)". Aviation Safety Network. Retrieved 7 March 2015. ^ "Criminal Occurrence description – Convair CV-880-22M-21 VR-HFZ". Aviation Safety Network. Retrieved 2 July 2009. Wikimedia Commons has media related to Cathay Pacific.